Stella, Stella, Stella! Oh, oops, wait, that’s from a movie. Never mind. Back to the paella. Spain is a great country for paella. If you like paella, that is. I have to confess I’m not a huge fan, especially since the ones I encountered were mostly seafood versions. And, no, I don’t like seafood…unless it’s in a Japanese restaurant in the form of sushi. So I had high hopes for this dish, a homemade vegetarian paella, served up by our hosts at La Casa Magica in Villatuerta. While I wasn’t overwhelmed by it, the dish was certainly flavorful, the veggies fresh, and it was quite filling. I selectively dug out the rice and veggies I like most and made a meal out of that, along with the ubiquitous bread that was everywhere with every meal (or so it seemed). The most enjoyable part of the dinner, as with most evenings, was the company that we enjoyed surrounded by citizens of a variety of nations from as close as France and as far away as Asia. There was Henry and Alba, originally from Venezuela but now residing in Canada, Amy from South Korea, Essa from Finland (Essa seemed to be rather fond of Amy, but it didn’t seem she was reciprocating), and the trio from Killarney in Ireland, among others. We had already met “Ireland” (as we called them) along the trail thanks to the decorative ribbons on my backpack. Being that I travel most frequently with Lindblad Expeditions, I have a multitude of their blue and yellow ribbons (which they provide to better identify your luggage during group airport transfers) and are – I’m told – based on the flag of Sweden where Lars Eric Lindblad (Sven Olaf’s father) was born. It turns out they’re also the colors of Killarney, Ireland, and “Ireland” wondered if perhaps I hailed from their hometown. Alas, I do not, although I am of Irish descent. (My mother’s family immigrated to the U.S. during the great potato famine in the mid-1800s). While one of her relatives has done a genealogy, I don’t remember most of the details so I can’t say whether we might actually be from Killarney. Too bad I’m not, for the young-ish male third of “Ireland” was quite handsome. Yes, we really did refer to people by their country (or town). it was easier to remember. And, being a horror writer, it reminded me of the movie “Zombieland” where the characters referred to each other by their hometowns (like Columbus and Tallahassee) lest they become too familiar with and attached to one another. Not that I was expecting the zombie apocalypse to occur while we were on the Camino, but I certainly had ample opportunity to let my mind wander while walking, concocting all sorts of scenarios for future horror stories. 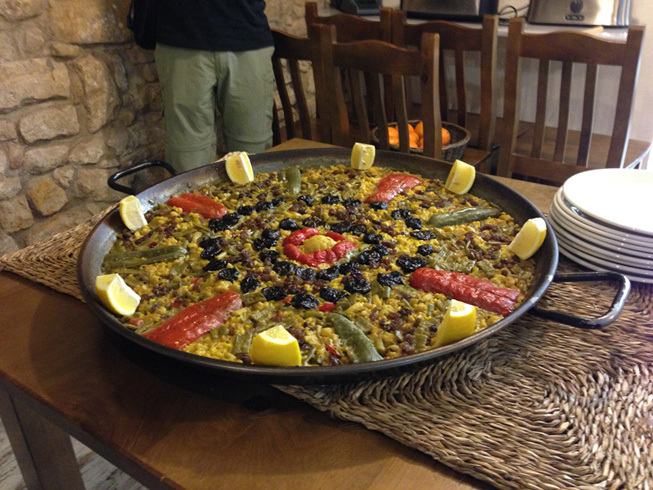 Like, what if that paella dish – easily two feet across – had been a zombie’s dream: brain paella. Hmm Hmm Good.